Treaty tribes in western Washington released more than 41 million hatchery salmon in 2018. Of the 41 million salmon released, 13.1 million were chinook. Significant numbers of chum (19 million) and coho (8 million) also were released, in addition to almost 660,000 steelhead and 836,000 sockeye. Some of the salmon released by the tribes were produced in cooperation with the state Department of Fish and Wildlife, U.S. Fish and Wildlife Service, state regional enhancement groups, or other sport or community groups. You can view a map and table of tribal hatchery releases here. 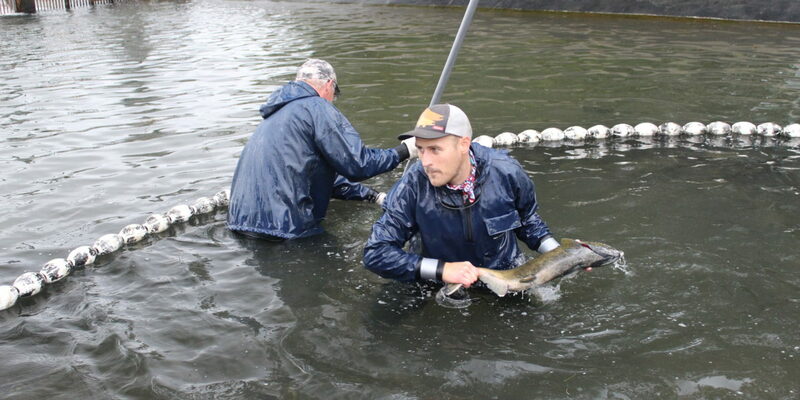 Nearly all of the chinook and coho salmon produced at tribal hatcheries were mass-marked by removing the adipose fin – a fleshy extremity just behind the dorsal fin on the fish’s back. Clipping the fin makes for easy identification when the hatchery fish return as adults and are harvested. Many of the fish also were implanted with a tiny coded-wire tag that identifies their hatchery of origin. When recovered on the spawning grounds or when the fish are harvested, data from the coded-wire tag are used to determine migration patterns, contribution rates to various fisheries and other information important to fisheries management.